Last week, we experienced a celestial double whammy — a full moon and, at five minutes, the shortest total lunar eclipse of the century. But we didn’t need to look to the heavens to know things were out of whack. Here on Planet Earth there have been some strange happenings in the field of play. For instance, why has it taken more than 150 years of soccer to see a goal like this? I can’t believe it’s legal but it sure is genius. It requires not only footy smarts and ball skills, but stagecraft, acting chops and comic timing. It’s a set play with a narrative. I wouldn’t be surprised if Woody Allen directed it. From an Aaron Sorkin script. Not to be outdone, the Hong Kong Rugby Sevens tournament celebrated its 40th anniversary by showcasing a new-fangled game called kung fu rugby. And I so want this to take off. In Rio, Mayor Eduardo Paes was proudly showing off the city’s Olympic Park, home of next year’s Games. A sight which fills us all with confidence, doesn’t it? While we’re at it, take a look at the Olympics logo and riddle me this: Is it a cricket box, a G-string or a slingshot? Maybe even a chastity belt. A mankini, perhaps. Or an incontinence pad. The options are endless, really. Just none too savoury. In the Caribbean, English cricket captain Alastair Cook scored his first century in a year and a half. Admittedly it was against St Kitts and Nevis, a team so depleted it had to borrow three Poms to bolster its ranks. Sounds like a jaded British hack, right? Except it was the England and Wales Cricket Board. Cook’s employer. On this performance, I reckon the ECB could take up a sideline gig on the motivational speaking circuit. 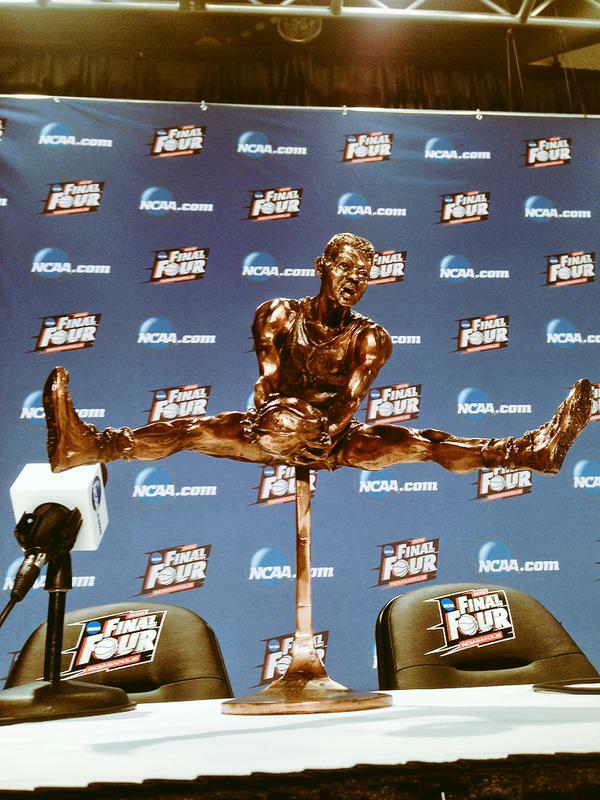 Meanwhile, this trophy was being handed out to the US college basketball player of the year. No matter who wins it, no one knows quite how to hold it. At any rate, a worthy addition to this selection. Floyd Mayweather revealed he’s going to wear a $25,000 mouthguard embedded with diamonds, gold and $100 bills for next month’s fight with Manny Pacquiao. I hope Manny rams it so far down Floyd’s throat, they have to call in a proctologist to remove it. Now, it may not look it but this is an incredible photo. A long line of blokes at a sports stadium and the immediate thought is: beer queue. Think again. This is the line for the toilets. I know, men don’t queue for loos. 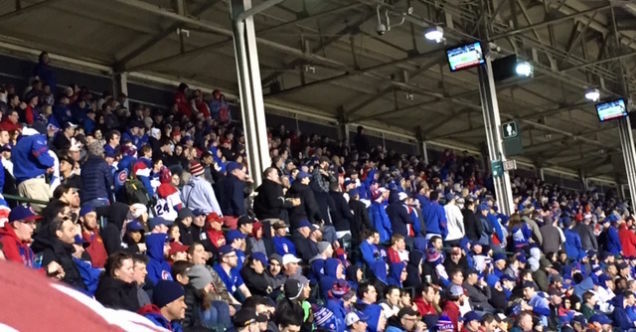 Except at Wrigley Field which, mid-renovation, thought it would be OK to open the season with two functioning bathrooms. In return, patrons thought it would be OK to pee in cups. The ground is rushing in a stash of portaloos for game two. And finally, I leave you with this pearler from the lads at Michigan Rugby. Smile guaranteed or your money back. Enjoy your weekend. Next Post How do we build on the legacy of these two men?